Michigan was the first English-speaking jurisdiction in the world to abolish the death penalty for ordinary crimes. Death penalty foes celebrate March 1 as “International Death Penalty Abolition Day” (pdf) after the date Michigan’s law took effect. Simmons himself was a minor malefactor in the scheme of things but amply detested in the day of his crime. A tavern-keeper by trade, he had a habit of getting into the whiskey himself, to violent effect. One night at home, a sodden Simmons picked a fight with his wife Livana and killed her with a vicious blow to the abdomen. The main trouble in this noteworthy trial (pdf) was seating a jury not completely biased against him. Sounds like a place about to abolish the death penalty, right? ET: To set the scene, what is Detroit like in 1830? DC: In 1830 Detroit was the capital of the Michigan Territory, but it had only about 2,000 inhabitants. It was, though, a bustling community because it was the entryway for the tens of thousands of settlers heading into the wilderness west and north of Detroit. 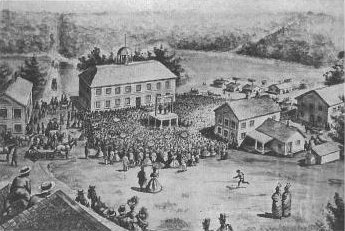 Most buildings were on a narrow strip of land between the river and Jefferson Avenue, although the capitol, jail, and Simmons’s execution site were further north, about a half mile from the river. This was the last execution in Michigan, but to what extent can we really say that it led to the end of the death penalty there? It strikes me that support must have been pretty soft to start with if that’s the case. To be precise, the last execution under Michigan law — there were 2 executions under federal law a short time later and the Chebatoris execution in the 1930s. I conclude in my book that there is no real evidence that the Simmons case caused the abolition of capital punishment. Most people living in Michigan in the 1840s, and almost all of the legislators who voted for abolition, arrived in Michigan after 1830 and there was no mention of that case in the extensive debates in the constitutional conventions in 1835-36 or in the legislature in the 1840s. However, incidents surrounding the Simmons execution show that unease about capital punishment existed in 1830. First, the fact that most killers before and after 1830 were convicted of manslaughter whatever the facts. Second, the alleged mob that tore down the city whipping post right after Simmons’s execution. Third, Governor Cass, in his annual address a couple of months later stated that he was sorry that the law did not allow him to reduce Simmons’s sentence to time in prison. Why was it that this one hanging, of a guy who had clearly killed his wife even if not intentionally, so powerfully affected people? And how troubled were Michiganders by the case itself, before the specific events of execution day? Whatever effect the Simmons execution had on the spectators had little to do with Simmons but rather their exposure to a gruesome death. The people seem to have been genuinely outraged by the crime and the fact that the victim was his wife, so that it was very difficult to seat a fair jury. There is little to no evidence of any sympathy for Simmons. What about the accounts of attendees stunned and shamed by Simmons’ last-minute plea for mercy in the midst of the public-festival environment. In the book, I explain that my research puts this whole story very much in doubt. It first appeared almost 50 years later in a speech at the state historical convention, but it is not clear that the speaker was even in town that day. It was picked up and repeated by subsequent writers, but the Detroit newspaper at the time made no mention of it, nor did the very few other witness accounts. 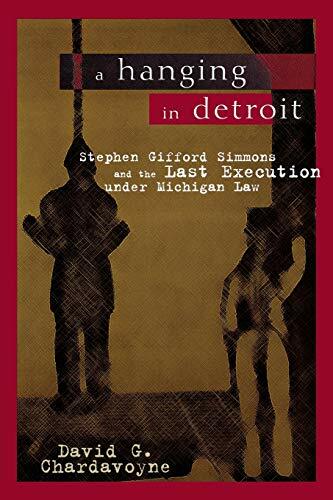 When Michigan did abolish the death penalty, how were people talking about the Simmons case? Did it swing any votes? Again, the Simmons case seems to have been forgotten by then, or at least neither side thought that it would help their arguments. We’re accustomed now to think of clemency decisions as highly political. How did Lewis Cass’s political aspirations affect his handling of Simmons, if they did at all? And for that matter, did he or anyone else end up suffering any political fallout for the way events ultimately transpired? As noted above, under territorial law Cass’s only option was to pardon Simmons — he could not just reduce the sentence. It may or may not have been relevant that he left town early on the day of the execution to visit his mother in Ohio and did not attend the execution. What’s really amazing is that Michigan has kept the death penalty off the books for nearing two centuries. That can’t all be about Stephen Simmons. What is it about Michigan’s culture, politics, or demographics that has kept it so staunchly anti-death penalty? This is a question that writers have been asking for decades. Remember that abolition was a close-run thing. Religion, political party, and other divisions do not appear to have been a factor in the voting. My guess is that it had to do with personality. The legislators in 1846 were mostly young men who were adventurous and optimistic enough to leave their friends and families in the east for the frontier. Such people, according to my psychologist friends tend to be against capital punishment. Why capital punishment was never reinstated is a tribute, I think, to the fact that the system works. Every so often a particularly bad killing starts politicians shouting about bringing it back, but it never goes anywhere. Since 1963, of course, the ban has been in our state constitution, and removing it would be very difficult. * As Prof. Chardavoyne mentions, a few executions have been conducted in Michigan under federal (not state) law since 1830.